With the arrival of the acclaimed Korg SDD-3000 pedal earlier this year, we take a look at how the much-loved rackmount delay unit came to be reborn in its current stompbox form. For someone who relied so much on getting the timing of a delay just right, to mesh in with his picking hand and create rhythmic repeats, The Edge must have been mightily pleased with the new rackmount digital delays that became available in the 1980s, which allowed you to dial in an exact delay time in milliseconds. So much so that he started using them as an integral part of his setup. 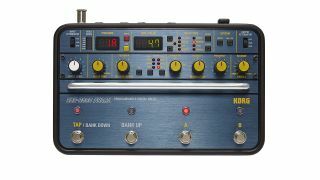 "There are several reasons why the SDD-3000 became a classic, notably a comprehensive modulation section and its input/output attenuators"
Rackmount models that have long been associated with the U2 guitarist include the TC Electronic 2290, but perhaps the one that's most closely associated is the Korg SDD-3000, a model that it is known he was working with around the time of The Unforgettable Fire album and has remained part of his setup since. There are several reasons why the SDD-3000 became a classic, much-used effect, not just by the Edge but by Daniel Lanois and other bands, both live and in recording studios, where an SDD-3000 was often an essential item in the effects rack. The ability to dial in exact delay times to suit the tempo of a song is an important aspect, but there were other things, notably a comprehensive modulation section, filters to EQ the repeats and the sound of the preamp, and its input/ output attenuators to set the levels for a variety of interfaces, particularly useful for guitarists in that you could set a high output to drive a guitar amp. Now, among guitar-playing fans of U2, the SDD-3000 has achieved legendary status, with vintage units keenly sought on eBay and going for a reasonable amount of money, even though they often need a bit of TLC, such as changing the internal battery and installing new capacitors. There's also a cottage industry of stompbox builders cloning just the preamp - from that and forum chatter, it would seem that a new version from Korg might be welcomed. "The SDD-3000 pedal has come about following an approach from Dallas Schoo, guitar tech for The Edge"
So, when we got wind of the fact Korg was going to revive the SDD-3000 as a pedal, we thought it may have been down to fan demand, but not at all. The SDD-3000 pedal has come about following an approach from Dallas Schoo, guitar tech for The Edge, who needed a solution for his ageing, failing rack units. Of course, we were intrigued, and wondered whether the new version would remain true to the original or take advantage of the increased processing power available today. "The SDD-3000 Pedal has some seriously upgraded hardware," says designer Dave Clarke. "It now features 80 storable presets with 4000ms of delay time. You also have the ability to try other delay voices, not just the SDD-3000 voice; there's everything from analog to reverse delays. "Another great addition is the expression pedal input - you can assign any effect parameters (singularly or in combination) to give real-time control of your sound. We've also incorporated MIDI. The pedal supports MIDI channel switching, MIDI dumping of presets from pedal to pedal, or even MIDI dumping the presets to a Mac or PC. "You can create backups of all your presets and dump them back into your pedal. When set to MIDI out, the SDD-3000 can be used as a MIDI channel switcher, so you can have more than one SDD-3000 controlled by just one pedal." Read our full review of the KorgSDD- 3000on the link below.